Anyone invested in the growing sector of personalized, or "precision" medicine, pharmaceuticals, medical devices and diagnostics will want to attend “Companion Diagnostics & Personalized Medicine,” a market research seminar, networking and Q&A event in San Diego, California on November 9. Below you’ll find a few discussion highlights from Senior Editor Robert G. Hunter. BCC Research Members can attend for free. Additionally, limited comp tickets are still available to parties considering BCC Research membership. Translational sciences and markets point to major new opportunities growing >30% CAGR for clinical diagnostics to support huge immuno-oncology demand: PD-L1 and Beyond. These innovations are fueling a pipeline from research to clinical applications. 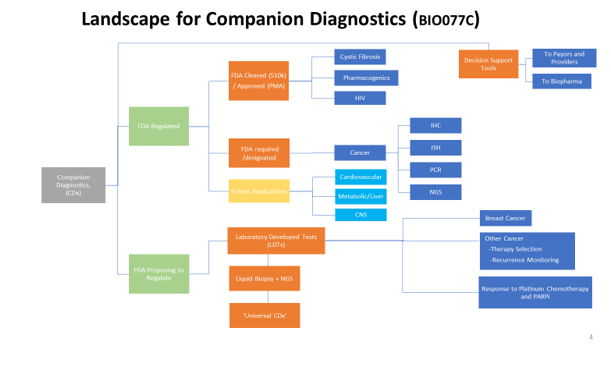 Technology enablers include sequencing (NGS, (dd)PCR) and liquid biopsy, which encompasses many different approaches (cfDNA, exosome, miRNA), resulting in hyper segmentation and requiring strategists to maintain knowledge across several translational sciences/markets as well as a dynamic companion diagnostics (CDx) landscape, which is growing > 30% CAGR. In some cases, translational disciplines are opening new research breakthroughs. For example, exosomes and others are fueling liquid biopsy growth at a > 100% CAGR. This example will be discussed in detail, covering technologies, applications, markets, trends and implications by Dr. Marianna Tcherpakov (see bio). As Immuno-oncology grows rapidly in the near-future, to support development and manufacturing of these biologics, we predict that testing of biologics will be a major focus of innovation, to mature and scale the commercial landscape. These insights come from our forthcoming report on Biologics Safety Testing (Jan ’18), and an overview will be presented. In the last five years, Marianna worked in business development sector for variety of biotech companies. She has extensive knowledge in marketing and client management in different segments of pharma and biotech industry including antibody production, gene editing and GMP manufacturing. *Market/technology research and business development for $7B metabolomics market, $5 B in vitro and in silico market, and $400 M 3D cell culture market. Developed thought-leadership and maintain industry forecasts and business relationships. *Product development and commercialization plan for Worcester Polytechnic incubator for in vitro diagnostic and tissue applications. Previously, served as interim CEO of spinout. *Market analysis, commercialization and product development planning for spinout of Clemson University in medical simulation and clinical training applications. Previously, helped to vet various technologies e.g. biomaterials, 3D cell culture, tissue engineering, and regenerative medicine.